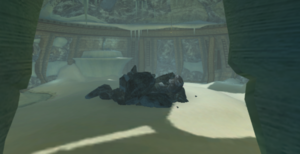 The Quarantine Cave is a large room in Phendrana Drifts where Thardus was placed pending relocation when it became too dangerous. The walls of the Quarantine Cave have Spider Ball Tracks, allowing visitors with equipment capable of traveling on them access to the room's exits. During Samus's first visit, she battles Thardus and claims the Spider Ball after defeating the creature. In any subsequent visits, the Quarantine Cave is inhabited by a lone Sheegoth. The Quarantine Monitor can be accessed from an upper ledge by using the Grapple Beam.